You hate to even contemplate it: You're out for a run or bike ride and something happens—an oncoming driver isn't paying attention, your tire blows, whatever—and you wind up seriously injured and unconscious to boot. At that point, your ID (which you always have with you, right?) will only get you so far. What you really need is something that will tell the EMT or doctor all your medical info, without having to track down your emergency contact first. (Besides, has your emergency person memorized your blood type? Your insurance number? Mine hasn't.) 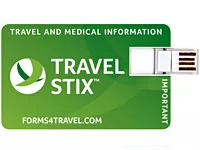 Here's the best solution I've seen: Travel Stix. This gadget acts like a flash drive, but it's the size and shape of a credit card. It comes loaded with Adobe documents you can fill in (and update) to let key people know your medical history, medications you're taking, blood type, allergies, emergency contact info, insurance details—in other words, all the stuff someone would need to know if you were hurt and couldn't speak for yourself. There are also forms for your travel itinerary and health care proxy info (in other words, who's going to make decisions for you if you're unable to), in case you're on the road. Now I've seen a couple of other services that offer to store this kind of info online, but you need an internet connection to access it, plus they usually charge a subscription fee. Not so with the Travel Stix: You just flip up the USB connector, plug it into the computer, and there's your info. Plus, once you've bought it, you're set—it won't cost you another dime. Bonus: You can scan and load signed copies of your will and living will, plus birth certificate, passport, driver's license—you name it. I'm headed to New York City next week to do the NYC Skate Half Marathon with some girlfriends (more on that in a future blog!). I've started carrying this card during training sessions—and I'm taking it with me on the trip, no question. Pros: It's a genius, easy-access way to keep crucial medical info handy during workouts and while traveling. Extra tip: Store it in your wallet when you're not working out—you never know when something like this might come in handy.